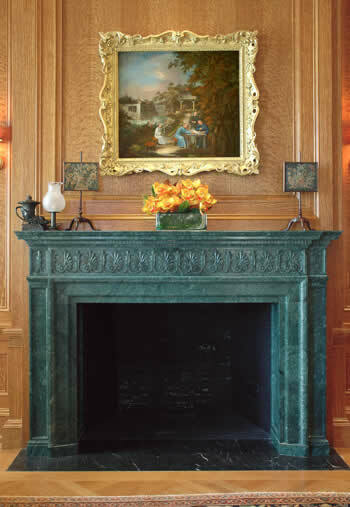 The stone used for this fireplace mantel is a very beautiful Italian marble. For this New York City mansion, the cool green marble complements the oak paneling perfectly. A fireplace mantel like this is an excellent example of the specialty work done at DMS Studios Ltd. 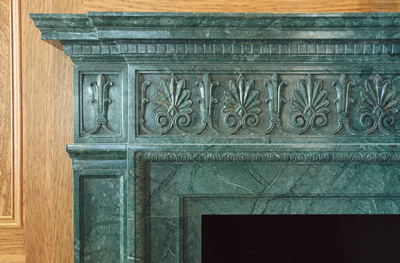 The Greek palmetto leaves are crisply hand carved into this fireplace mantel. This is a typical design seen on many Greek temples. This mantel in particular has a very classic design, at DMS Studios Ltd. we are capable of working in any stlye or time period. View our portfolio to see other designs and contact us for a consultation.